Using Chandra spectra obtained from more than 300 supermassive black holes in the centers of galaxies, a team of astronomers has been able to determine the amount of iron near the black holes (light blue in illustration on the right). The black holes were all located in the North and South Chandra Deep Fields, where the faintest and most-distant X-ray objects can be identified. 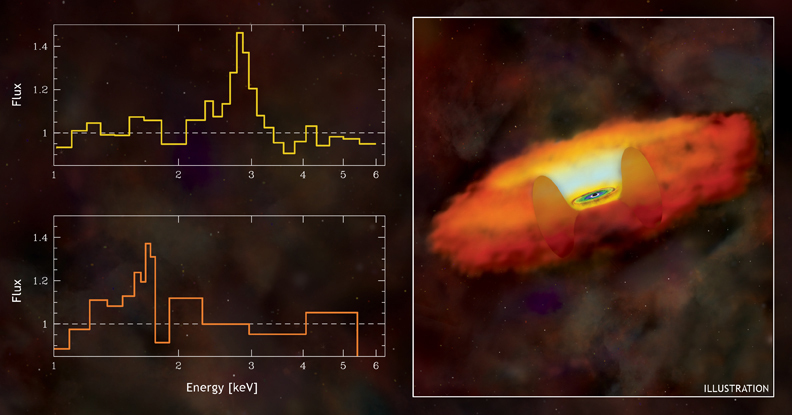 The left side of the above graphic shows portions of X-ray spectra from a subset of 50 black holes about 9 billion light years away (upper panel), and another group of 22 black holes that are about 11 billion light years away (lower panel). The peaks in the spectra are produced by X-ray emission from iron atoms, and indicate that approximately the same amount of iron was present around black holes 9 billion years and 11 billion years in the past. Similar results corresponding to times ranging from 5 billion years to 9 billion years in the past show that the amount of iron around black holes has not changed significantly over the past 11 billion years. This implies that most of the iron in the galaxies that contain these supermassive black holes was created before the Universe was about 2 billion years old, when galaxies were very young. The distinctive X-ray spectral peaks are produced by the fluorescence of iron atoms in a doughnut-shaped torus orbiting a supermassive black hole. In this process, high-energy X-rays from hot gas very near the black hole excite the iron atoms to a higher energy state, and they almost immediately return to their lower energy state with the emission of a lower-energy, fluorescent X-ray. Coordinates (J2000) RA 12h 36m 45.70s | Dec +62° 13' 58.00"